The best way to prevent skin damage is to protect your skin. But is it really that easy? The good news is you’re never too young or too old to start taking care of your skin. However, the sooner you start taking preventative measures, the better, and the longer you can go without seeing the effects of skin damage. Makes sense, right? Skin care and skin protection is an essential part of health and, if you haven’t already, it would be worthwhile implementing it into your beauty regime. Skin damage can be caused by many factors including genetic and environmental. Sun, wind, pollutants and aging all contribute when it comes to degrading the condition of your skin. These environmental factors cause wrinkles, sagging, dry and itchy skin and age spots. So how do we prevent skin damage? Your skin requires vitamins, minerals and nutrients to maintain and repair cells. The foundation for beautiful, healthy and glowing skin is good nutrition, exercise, and rest. A proper, healthy diet helps to ensure your skin is getting the nutrients it needs to stay healthy. A balanced diet looks after your skin from the inside, out. Yes, balanced does mean cutting down on the amount of foods we know we shouldn’t be eating but it doesn’t mean we have to cut them out completely. They are fine in moderation. Drinking lots of water is also important for keeping your skin healthy. Water helps your body hydrate your skin and move waste and nutrients through the system. Ultraviolet radiation is the main culprit for skin damage. Our skin is exposed to ultraviolet rays from the sun on a daily basis, which is why protecting our skin from the damaging rays is the most important way to prevent skin damage. Using sunscreen will help protect your skin from the sun’s rays – the American Academy of Dermatology recommends daily use of a sunscreen with a sun protection factor (SPF) of at least 15. An SPF of 30 or higher should be used on sunny days for extra protection. SPF is the sun protection factor (SPF) in sunscreens that tells you how well they prevent sunburns. Choosing a sunscreen with the right SPF will prevent sunburn and skin damage. For maximum skin protection you should wear sunscreen every day, in every season, even if it’s cloudy, rainy, or cold outside. Put it all over your skin about 15 to 30 minutes before going outside, and it will help prevent skin damage. Sun Damage from ultraviolet rays destroys certain fibers in the skin called elastin. The breakdown of elastin fibers causes the skin to sag, stretch, and lose its ability to snap back after stretching. Due to this process, we later experience wrinkles and develop sun spots. For those of you that may already be experiencing the effects of skin damage and sun damage, we at Aesthetics of Essex, can help you rejuvenate your skin. 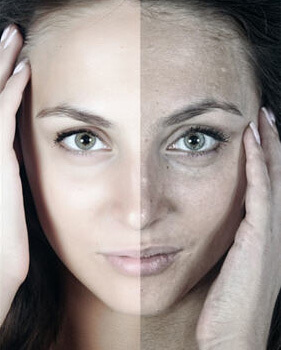 Our CryoPen treatment effectively reverses the effects of sun damage by safely removing sunspots. We also have a large range of skin rejuvenating treatments to help improve the overall appearance wrinkles and skin pigmentation, include skin peels. To find which skin rejuvenation treatments is best for you or if you’re looking for a treatment to improve your sun damaged skin, lighten acne scars, promote collagen production or improve the appearance of wrinkles, contact us on 01708 225555 to book a free consultation.